This article leads you through the configuration steps for backup of SQL Server databases using Azure Backup. To back up SQL Server databases to Azure, you need an Azure account. If you don’t have an account, you can create a free trial account in just couple of minutes. For details, see Azure Free Trial. 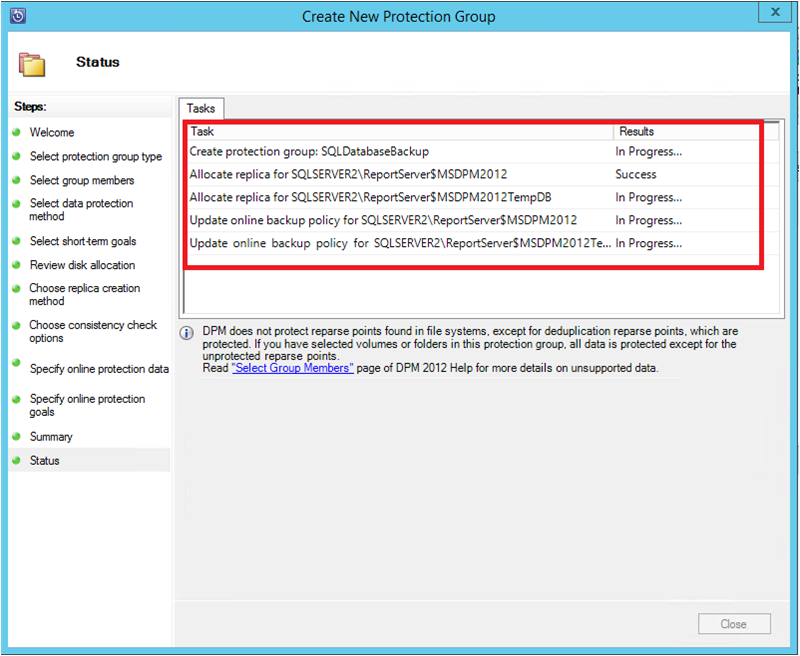 Create a backup policy to protect SQL Server databases to Azure. Create on-demand backup copies to Azure. Recover the database from Azure. Before you begin, ensure that all the prerequisites for using Microsoft Azure Backup to protect workloads have been met. The prerequisites cover tasks such as: creating a backup vault, downloading vault credentials, installing the Azure Backup Agent, and registering the server with the vault. On the DPM server, click the Protection workspace. 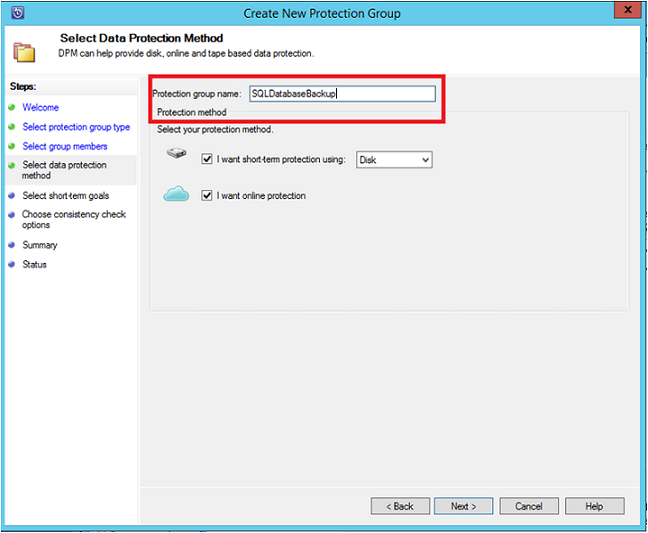 On the tool ribbon, click New to create a new protection group. DPM shows the start screen with the guidance on creating a Protection Group. Click Next. Expand the SQL Server machine where the databases to be backed up are present. DPM shows various data sources that can be backed up from that server. Expand the All SQL Shares and select the databases (in this case we selected ReportServer$MSDPM2012 and ReportServer$MSDPM2012TempDB) to be backed up. Click Next. Provide a name for the protection group and select the I want online Protection checkbox. 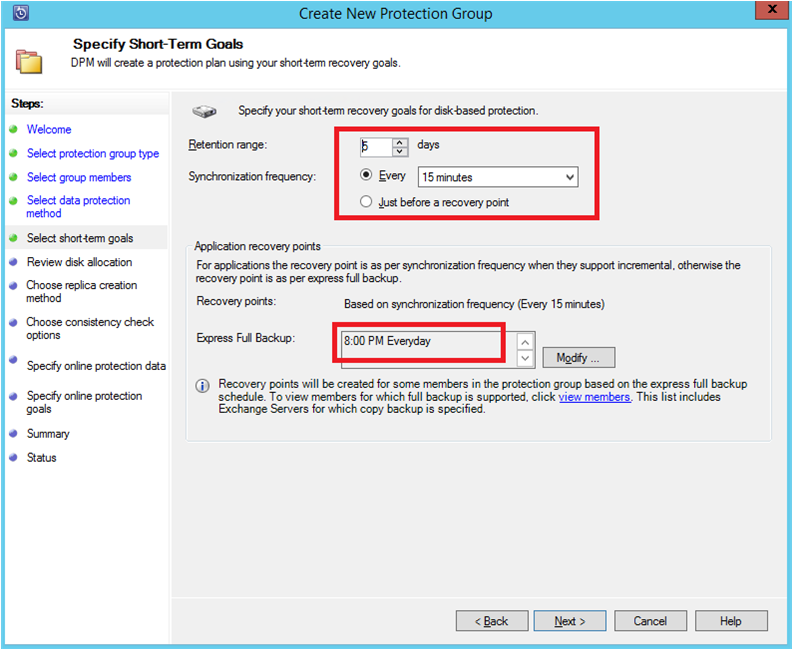 In the Specify Short-Term Goals screen, include the necessary inputs to create backup points to disk. Here we see that Retention range is set to 5 days, Synchronization frequency is set to once every 15 minutes which is the frequency at which backup is taken. Express Full Backup is set to 8:00 P.M.
At 8:00 PM (according to the screen input) a backup point is created every day by transferring the data that has been modified from the previous day’s 8:00 PM backup point. This process is called Express Full Backup. While the transaction logs are synchronized every 15 minutes, if there is a need to recover the database at 9:00 PM – then the point is created by replaying the logs from the last express full backup point (8pm in this case). DPM shows the overall storage space available and the potential disk space utilization. By default, DPM creates one volume per data source (SQL Server database) which is used for the initial backup copy. Using this approach, the Logical Disk Manager (LDM) limits DPM protection to 300 data sources (SQL Server databases). To work around this limitation, select the Co-locate data in DPM Storage Pool, option. If you use this option, DPM uses a single volume for multiple data sources, which allows DPM to protect up to 2000 SQL databases. If Automatically grow the volumes option is selected, DPM can account for the increased backup volume as the production data grows. 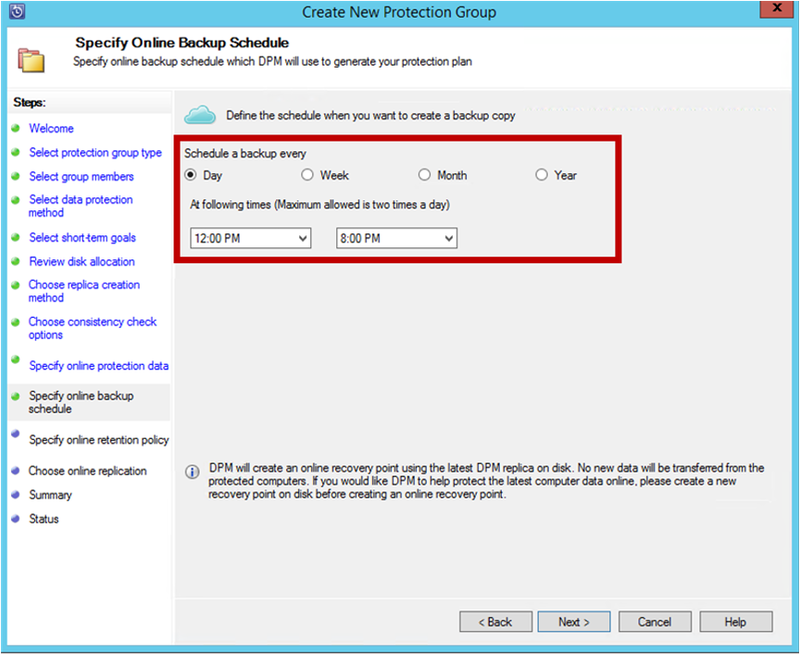 If Automatically grow the volumes option is not selected, DPM limits the backup storage used to the data sources in the protection group. Administrators are given the choice of transferring this initial backup manually (off network) to avoid bandwidth congestion or over the network. They can also configure the time at which the initial transfer can happen. Click Next. The initial backup copy requires transfer of the entire data source (SQL Server database) from production server (SQL Server machine) to the DPM server. This data might be large, and transferring the data over the network could exceed bandwidth. For this reason, administrators can choose to transfer the initial backup: Manually (using removable media) to avoid bandwidth congestion, or Automatically over the network (at a specified time). Once the initial backup is complete, the rest of the backups are incremental backups on the initial backup copy. Incremental backups tend to be small and are easily transferred across the network. Choose when you want the consistency check to run and click Next. 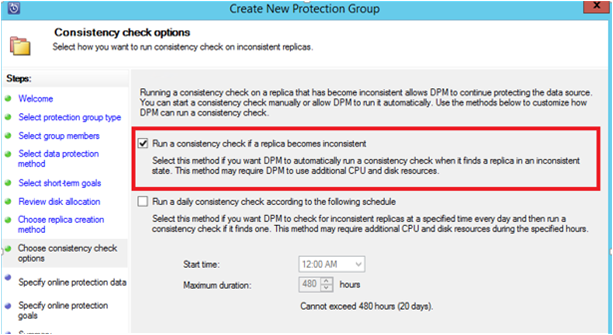 DPM can perform a consistency check to check the integrity of the backup point. It calculates the checksum of the backup file on the production server (SQL Server machine in this scenario) and the backed-up data for that file at DPM. In the case of a conflict, it is assumed that the backed-up file at DPM is corrupt. DPM rectifies the backed-up data by sending the blocks corresponding to the checksum mismatch. As the consistency check is a performance-intensive operation, administrators have the option of scheduling the consistency check or running it automatically. To specify online protection of the datasources, select the databases to be protected to Azure and click Next. Administrators can choose backup schedules and retention policies that suit their organization policies. It’s a good practice to have a few short-term recovery points on disk, for quick recovery. These recovery points are used for “operational recovery". Azure serves as a good offsite location with higher SLAs and guaranteed availability. Best Practice: Make sure that Azure Backups are scheduled after the completion of local disk backups using DPM. This enables the latest disk backup to be copied to Azure. Choose the retention policy schedule. The details on how the retention policy works are provided at Use Azure Backup to replace your tape infrastructure article. Backups are taken once a day at 12:00 PM and 8 PM (bottom part of the screen) and are retained for 180 days. Click Next and select the appropriate option for transferring the initial backup copy to Azure. You can choose Automatically over the network or Offline Backup. Automatically over the network transfers the backup data to Azure as per the schedule chosen for backup. How Offline Backup works is explained at Offline Backup workflow in Azure Backup. Choose the relevant transfer mechanism to send the initial backup copy to Azure and click Next. Once you review the policy details in the Summary screen, click on the Create group button to complete the workflow. You can click the Close button and monitor the job progress in Monitoring workspace. 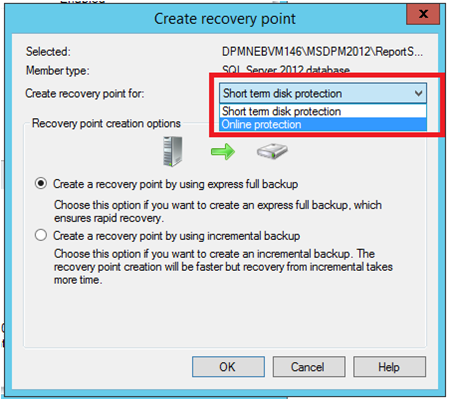 While the previous steps created a backup policy, a “recovery point” is created only when the first backup occurs. 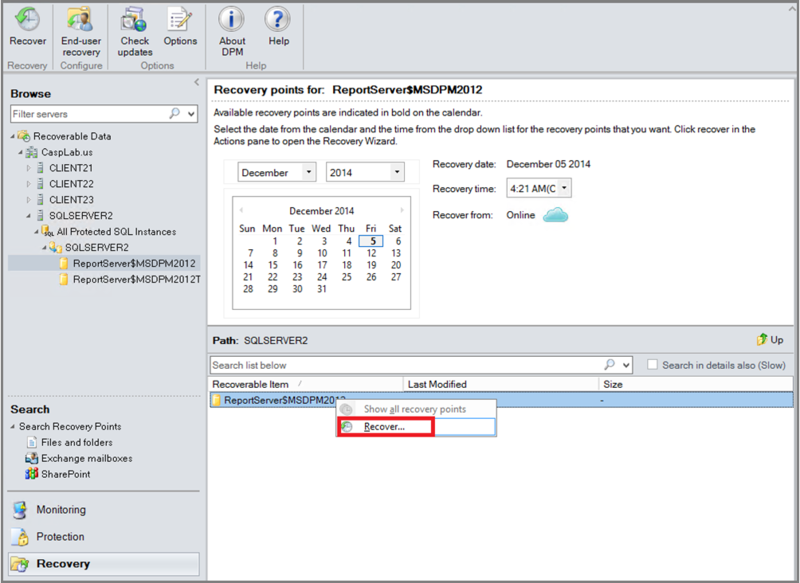 Rather than waiting for the scheduler to kick in, the steps below trigger the creation of a recovery point manually. 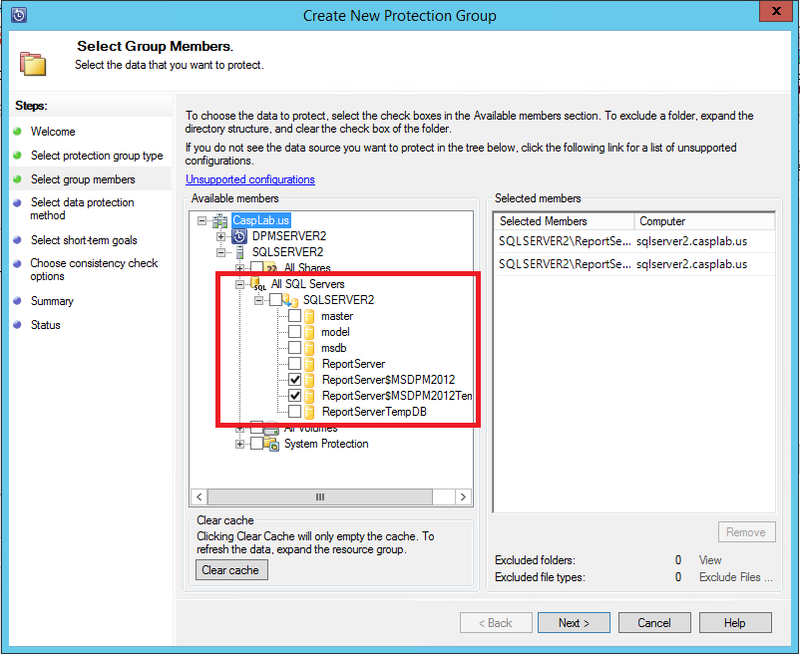 Wait until the protection group status shows OK for the database before creating the recovery point. Right-click on the database and select Create Recovery Point. Choose Online Protection in the drop-down menu and click OK. This starts the creation of a recovery point in Azure. You can view the job progress in the Monitoring workspace where you'll find an in progress job like the one depicted in the next figure. 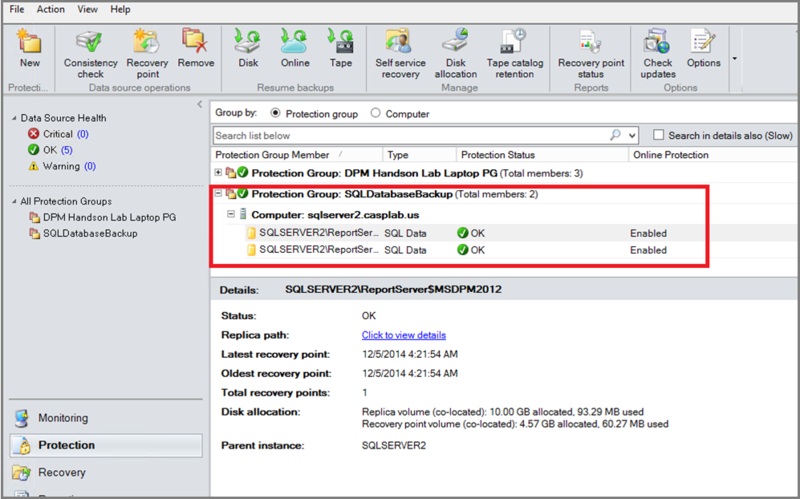 The following steps are required to recover a protected entity (SQL Server database) from Azure. 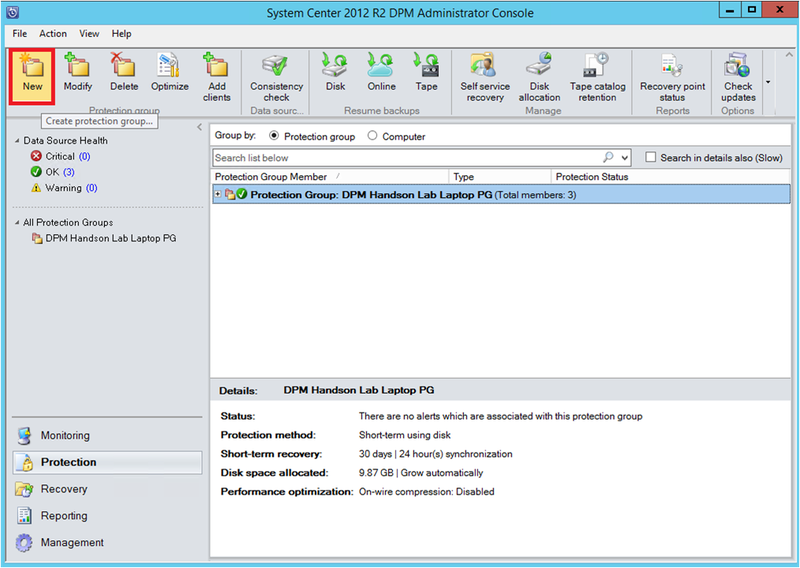 Open the DPM server Management Console. Navigate to Recovery workspace where you can see the servers backed up by DPM. Browse the required database (in this case ReportServer$MSDPM2012). Select a Recovery from time which ends with Online. Right-click the database name and click Recover. DPM shows the details of the recovery point. Click Next. 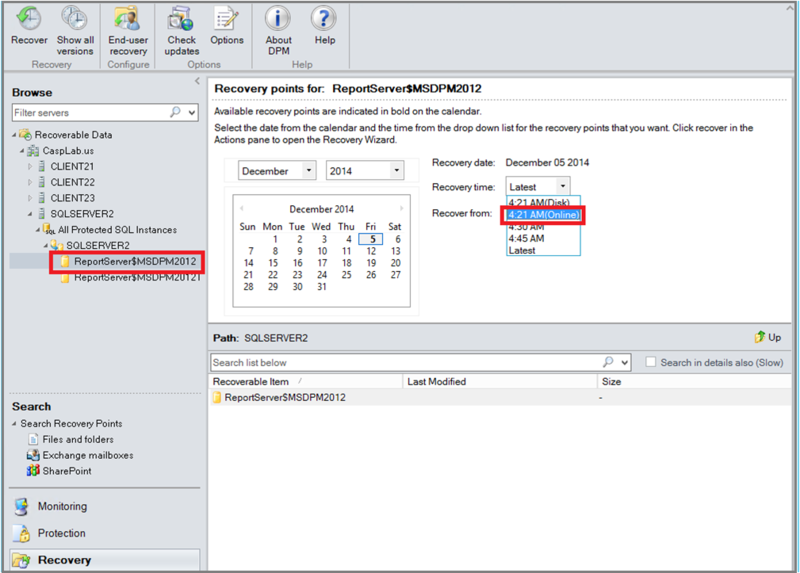 To overwrite the database, select the recovery type Recover to original instance of SQL Server. Click Next. 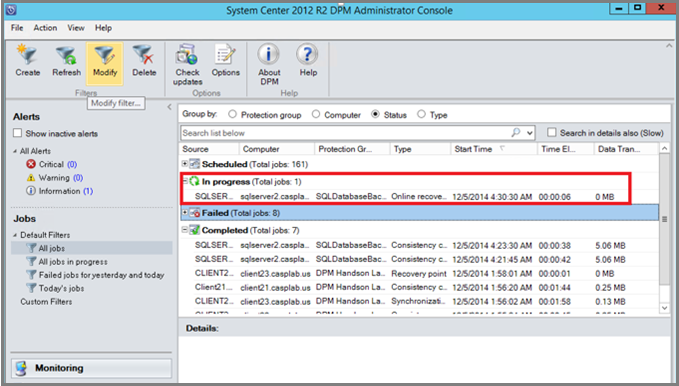 In this example, DPM allows recovery of the database to another SQL Server instance or to a standalone network folder. In the Specify Recovery options screen, you can select the recovery options like Network bandwidth usage throttling to throttle the bandwidth used by recovery. Click Next. In the Summary screen, you see all the recovery configurations provided so far. Click Recover. The Recovery status shows the database being recovered. You can click Close to close the wizard and view the progress in the Monitoring workspace. Once the recovery is completed, the restored database is application consistent.